In June, 1942, in reprisal for the assassination of the Nazi commander Reinhard Heydrich, the Germans carried out a murderous rampage of murder and terror throughout Czechoslovakia. The small Czech village of Lidice bore the brunt of the German revenge, with the SS killing all the men, deported all women and children and razed the village to the ground. Similarly, in March 1944, thirty-three German soldiers were killed when members of an Italian resistance group set off a bomb close to a column of German troops who were marching on via Rasella in Rome. Adolph Hitler got furious and ordered that within 24 hours, ten Italians were to be shot for each German soldier that had been killed. Herbert Kappler, the local German commander, quickly compiled a list of 320 civilians who were to be assassinated as vengeance. On March 24, the victims were transported to the Ardeatine caves where they were summarily executed by the SS. Numerous other ‘pacification operations’ w ere carried out by the Nazi armies against civilians throughout Nazi-occupied Europe, in which men, women and children were brutally killed to avenge the death of German occupation soldiers by local resistance fighters. 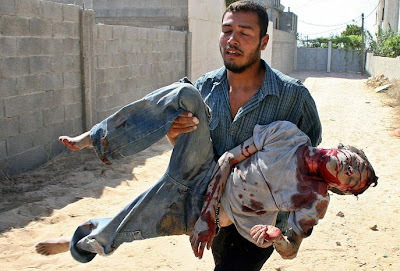 Now what is the difference between these Nazi atrocities and what Israel, the “only democracy in the Middle East” is doing in the Gaza Strip, where “the most moral army in the world” is slaughtering babies as young as six-months’ old? I know that many Zionists have developed almost instinctive knee- jerk defensive reactions to any comparisons between Israel and Nazi Germany. However, the truth must be proclaimed aloud, irrespective of how many Zionists will get angry. What Israel is doing to these helpless Palestinians is a virtual Holocaust or at least a Holocaust in the making. True, Israel had not introduced gas chambers in Beit Hanun a nd Khan Younis or Rafah. But they have American F-16s raining down bombs and death on sleeping children and women and innocent civilians. This is not a war. Wars occur between armies and states. It is conscionable that honest people around the world, including many conscientious Jews who can’t bear watching the heinous crimes Israel is committing in their collective name, must call the spade a spade. A Holocaust, after all, doesn’t become lesser when perpetrated by Jews. Once again, human decency is being affronted and insulted by Matan Vilnai, Israel’s deputy defense minister, who has gone as far as threatening the thoroughly tormented Gazans with a Holocaust. Is Vilnai vindicating the Nazi Holocaust? Today, people around the world, including millions of Jews, are watching the slaughter in Gaza live on their TV screens. And no amount of spin, lie, will make the images of mutilated babies look innocuous. Finally, the people of the world will not be duped by the propagandistic lies about so-called rocket attacks on Israeli towns, which are meant first and foremost to create an artificial equation between the wanton extermination of Gazans and the mainly psychological discomfort experienced by some Israeli citizens as a result of the fall of these nearly innocuous fire-crackers, fired by some desperate Gazans in order to deter Israel from killing more of their children. This is because Israel knows very well how calm and peace can be restored for both the people of Gaza and Israelis across the border: Lift the criminal siege on Gaza, allow Gazans to access food and to travel, allow them to export and import, and stop these daily massacres. And then not a single Qassam will be fired onto Israel.